Eva aime mes biscuits mais déteste ceux de sa tante. Eva likes my biscuits but hates her aunt's. Celles que je préfère sont les pommes vertes. The ones I prefer are the green apples. Dans ce groupe, le chanteur est celui avec des lunettes. In this band, the singer is the one with glasses. Regarde ces filles. Celle qui court s'appelle Sophia. Look at those girls. The one running is called Sophia. 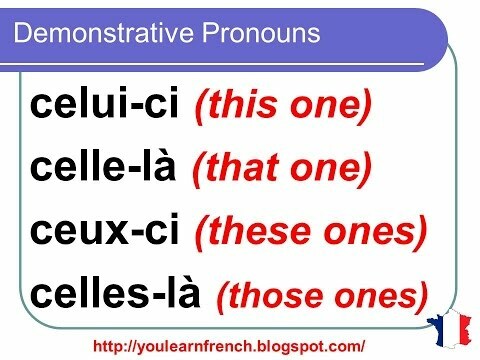 celui / celle (the one), ceux / celles (the ones). Note also that the pronouns agree in gender and number with the thing they refer to. C'est ton fils? - Non, c'est celui de Paul. Is it your son? - No, it's Paul's (one). I have seen celui-ci, celui-là, celle-ci, etc. used in text and I believe I have even seen them covered in a French class. I've looked, but can't seem to find any lesson that covers them on this site. Would you be able to explain when and how they are used as compared to simply celui, celle, etc as covered in this lesson? to help me remember which demonstrative pronoun to use. I'm surprised i haven't come across this somewhere else because now it seems obvious to me. Anyway, thought i'd share in case it can help others. of course, just remove the hyphen and you have your correct demonstrative pronoun! So you're never allowed to use l'un(e) or l'uns to mean the one, then? Tu es l'homme/la femme de ma vie. Tu es fait pour moi. OR you would use 'l'Elu(e)' in the chosen, heroic sense. But sometimes "celles" ... means "these", as in "Celles sont les miennes." Right? Bonjour Léon ! To express "These are mine", you would actually say "Ce sont les miennes" in French. To say "These ones are mine", you will need to use "Celles-ci / Celles-là sont les miennes": this is the colloquial use here. "Celles sont les miennes" is not correct in French, you need a qualifier (-ci or -là) to specify which alternative you're referring to (these or those). I hope that's helpful! Bonne Année !